Despite Pitt facing another top 10 team in the Oklahoma State Cowboys this weekend, Pitt football Head Coach Pat Narduzzi focused much of Monday’s press conference on last week’s rivalry game against Penn State. The Panthers lost the game with a lopsided score of 33-14, but they came close to making it competitive. The offense struggled all day in the red zone, committing one turnover and settling for field goals twice inside the Nittany Lions’ 20-yard line. The third-year coach fielded a question regarding Penn State Head Coach James Franklin’s controversial comments after the game. In Saturday night’s post-game press conference, Franklin said beating the Panthers was “just like beating Akron,” which many saw as demeaning toward Pitt. Narduzzi opted not to say much, but did offer a small response to Franklin in the end. Eventually, the conversation switched over to the Cowboys, who beat the Panthers last year 45-38 in what was Pitt’s first loss of the 2016 season. The pass defense struggled in the contest — a common theme throughout the year — giving up 540 yards through the air. Quarterback Mason Rudolph decided to return for his senior season with the Cowboys, along with standout wide receiver James Washington. Even though the Panthers’ pass defense has shown improvement early on this season, it will be a tough task for the secondary to control the Cowboys. In order to win, the Panthers will have to start by slowing down the Oklahoma State offense. In addition to Rudolph and Washington, the Cowboys boast an impressive rushing attack led by sophomore Justice Hill. So far this season, Hill has averaged over six yards per carry with 159 yards on 26 carries and one touchdown. 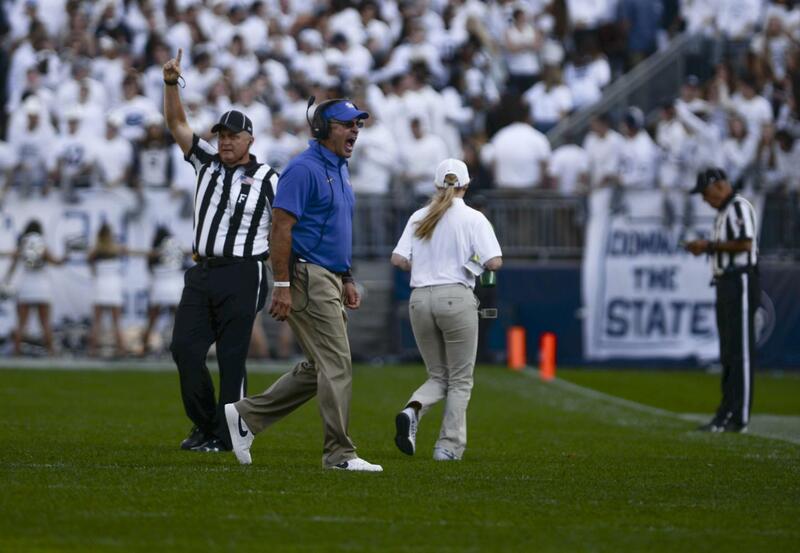 Last week Pitt faced Penn State junior running back Saquon Barkley. Barkley had quite a bit of success in the game, gaining 133 total yards to go along with two touchdowns. Pitt’s front seven will have to be better to stop Hill this week. But none of this matters if the Panthers can’t find a way to put up more points on offense. In two weeks, Pitt’s offense has only managed to put up 42 points — 35 not counting the overtime touchdown against Youngstown State. Over the past two weeks, the calls have consistently gotten louder for Narduzzi to bench redshirt senior quarterback Max Browne in favor of redshirt sophomore Ben DiNucci. At Penn State, DiNucci came in partway through the second half and scored the Panthers’ only touchdown of the day on a 3-yard designed run. Still, Narduzzi is deciding to stick with Browne, adding he was encouraged after he watched the film on Sunday. Overall, no matter who’s starting at quarterback, the Panthers will enter this game as the clear underdogs.